Progressive rock lovers all over, we have a truly unmissable show coming up for you! Get ready for none other than the legendary King Crimson on Friday 16th June 2017 at Fox Theater Oakland!Tickets will sell out FAST to see this iconic band so don’t delay in getting yours – book NOW to avoid disappointment!! One of the most important acts in helping to shape the sound of progressive rock, King Crimson’s album, “In The Court of the Crimson King”, released in 1969, had a massive impact upon listeners both at the time and forever after!! Incorporating elements of jazz, classical, and symphonic music and featuring an iconic lush, fully orchestrated sound, the album stunned critics and delighted audiences, reaching 5th place on the UK albums chart. Named by Classic Rock magazine as one of "50 Albums That Built Prog Rock,” and referred to by Pete Townsend of The Who as “an uncanny masterpiece" the album is widely regarded as one of the most important in the history of the genre. Since their formation in London in 1968, King Crimson has gone through significant lineup changes over time, of which 21 musicians have been members in total!! In 2017 the band members include Robert Fripp, Mel Collins, Pat Mastelotto, Jakko Jakszyk, Tony Levin, Gavin Harrison, Bill Rieflin and Jeremy Stacey, with Fripp being the band’s backbone as primary songwriter and general creative leader. 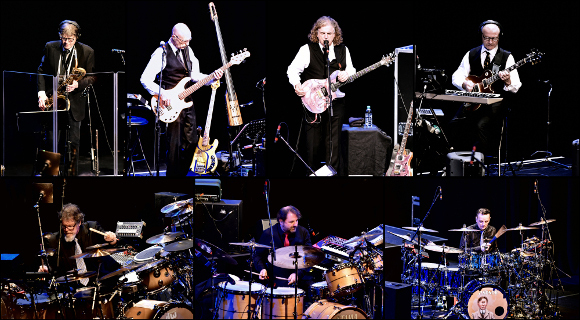 Don’t miss your chance to catch the band’s current incarnation in all their full glory live – get your tickets to see King Crimson TODAY!! !